KM III Max is an excellent choice for heavy exposure fixed lines, big wall hauling, caving, and a variety of rescue applications. Due to its well-balanced, low rotation and abrasion resistant design and its unique twill pattern polyester cover, it is perfect for work placement, photography and smooth descents. KM III Max features the same great construction as our standard KM III but with the added feature of our TPT construction. This results in a smoother cover that reduces drag and creates increased fine control on descents. 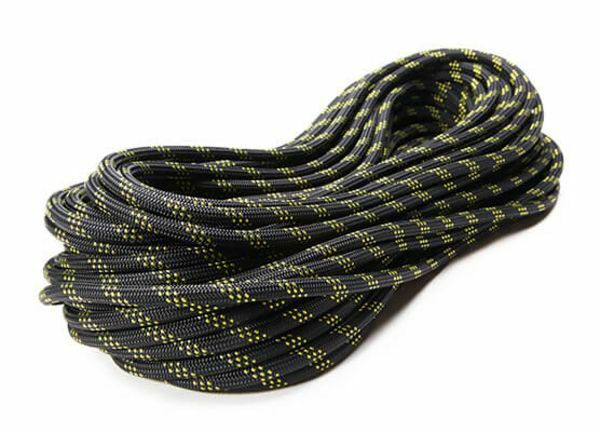 The smooth, low profile sheath allows for faster ascending and the reduced drag makes this rope perfect as a backup line. KM III Max is a static rope that is perfectly suited for big wall hauling or caving as well as for fixed line installations. The smooth polyester cover with the twill pattern design creates an incredibly smooth cover with higher tensile strengths. It also adds superior handling characteristics and makes the rope highly abrasion resistant. Our KM III Max is certified to EN and NFPA and is available in 3/8”, 7/16” and 1/2” (9.5mm, 11mm and 12.7mm) and in standard lengths ranging from 100’ (30m) to over a mile (>1600m). Custom lengths are available upon request.